Pump Solutions Australasia explains why peristaltic pumps are among the most versatile on the market and can be used for a variety of industrial and commercial applications. 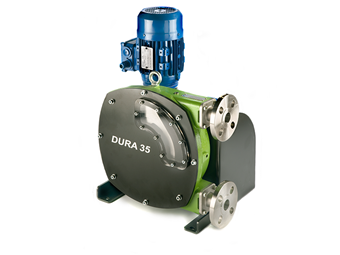 A Verderflex Dura 35 peristaltic pump — one of those sold by Pump Solutions Australasia. THE word ‘peristaltic’ comes from peristalsis, which is how most living beings transport food and liquids to nourish their bodies. On a human, for example, food is swallowed by a series of muscular contractions moving from the mouth to the stomach. This pushes the food in front of the contractions until it reaches the stomach. On a peristaltic pump, the tube is pinched or squeezed by a series of ‘rollers’ or ‘feet’ that are moved by a rotor in the desired direction of flow. Not only is fluid moved forward: a vacuum is created when the tube restores itself to its natural diameter after the roller passes. That creates suction, meaning there are two separate mechanisms for fluid movement: pushing and pulling. Due to this design, peristaltic pumps can be used for almost any kind of fluid. The only part of the pump that contacts the fluid is the tubing. This allows for virtually any level of viscosity to be safely and efficiently transported through the tubing. Also, the fluid doesn’t contact the pump itself, reducing the need for seals, valves and diaphragms. Since the tubing is the only place where the fluid contacts the pump, it is the only part of the pump that needs much maintenance. This also keeps the pump from contaminating the fluids inside. Peristaltic pumps can be used for aggressive fluids without the risk of corroding the pump parts. The action of a peristaltic pump is among the most gentle of any variety of pump. This allows them to be used for transporting delicate fluids such as those containing large cells without the risk of damaging the fluids. However, they can still move large amounts of fluids efficiently and promptly. Peristaltic pumps are used for most dosing applications because of their unparallelled accuracy. Peristaltic pumps are so accurate because they can be operated at a wide variety of speeds. They are used in applications such as dispensing pizza sauce, producing juice or injecting Vitamin D or Vitamin A into various products. The pumps are also used for a large variety of laboratory applications, such as moving sterilised media, supplying nutrients to cultures or moving aggressive acid or base materials with no fear of hazardous leaks. 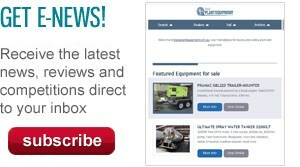 Click here to find peristaltic pumps for sale.